WARWICK Cowboys president David O'Leary was happy to give Highfields favouritism today in a battle for third at Highfields. Like the Maroons who are underdogs in State of Origin tonight, the underdogs Warwick had a 24-20 win at Highfields. "Paul Cantwell, Adam Fisher and Darren Pettiford were unavailable and Josh O'Brien is out injured,” O'Leary said. 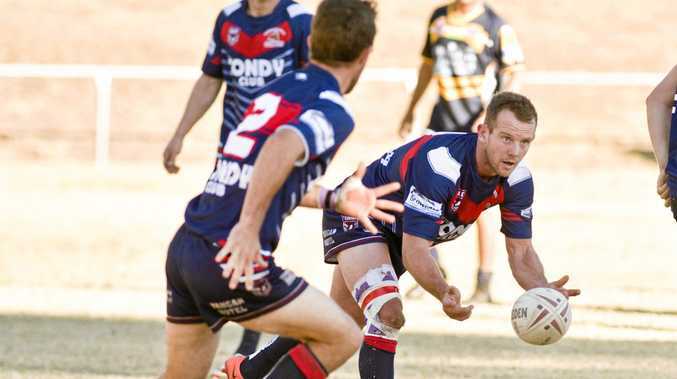 "We have had a lot of changes in the past two weeks including Queensland Cup player Dan Murphy ending his season early due to a shoulder injury. Warwick led 8-6 at halftime against a full strength Highfields side. The Cowboys skipped away to a 24-16 lead before a late try by Highfields reduced the margin to four points. In the last minute of play, Highfield were pressing the Warwick line before a dropped pass ended their hopes. Jarred Bradfield was outstanding for the Cowboys in the front row with centre Dylan Galloway the best of the backs. The whole Warwick forward pack stood up with Garry Ellery and captain Mick Bloomfield two of many forwards to rise to the occasion. Warwick lost winger Kai Etherington to a neck injury early in the game but O'Leary is hoping the winger will be fit for the game against Dalby on Sunday at Father Ranger Oval. Half Ben Sullivan went off with 15 minutes to go with a badly cut lip in the game at Highfields. Dave McGrady had a good first game for the club at five-eighth especially after Sullivan went off in the last 15 minutes. "We are hoping Ben will be right for the game against Dalby,” O'Leary said. In reserve grade, President's Cup winners Highfields won 48-4 and in the U18s, Highfields won 48-0. The first of three games against Dalby on Sunday in Warwick at 11.30am with A grade at 2.30pm between two teams in the top five.